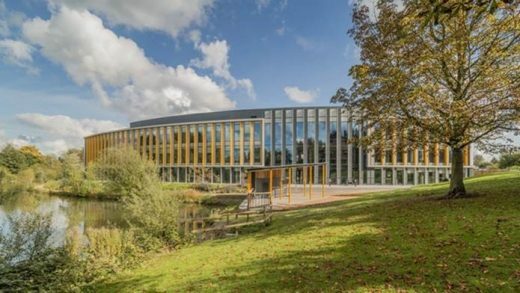 The Bradfield Centre – the first development to be built as part of a major new cycle of investment in the Cambridge Science Park – was launched recently with a spectacular party for over 600 guests. 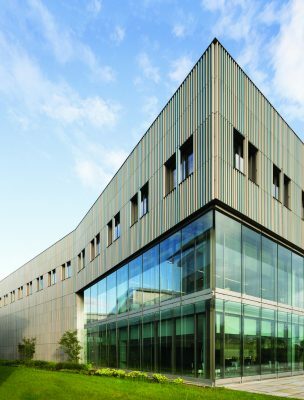 Since it was established by Trinity College in 1970, the Science Park has achieved widespread recognition for its pivotal role in the “Cambridge Phenomenon” – the transformation of Cambridge from a market town with a world-class university to one of the hottest technology hotspots in the world. 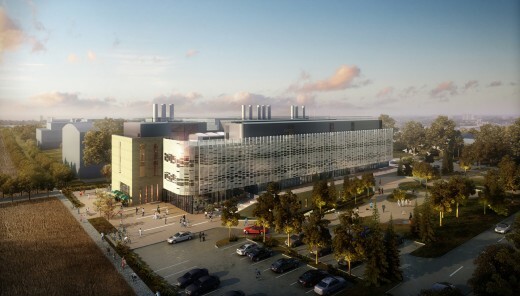 Today the 151-acre site is home to 6500 people employed in 100 businesses ranging from spin-outs from the University of Cambridge to multinational companies. The global impact of the Park is set to grow further with the opening of the Bradfield Centre. 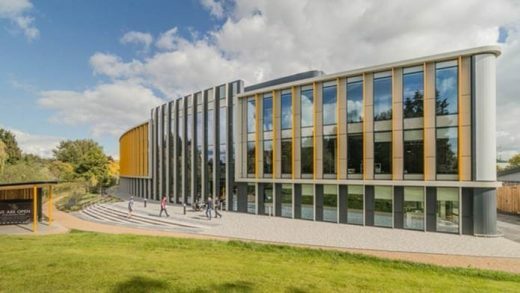 The new Centre which benefits from the nearby Cambridge North station with direct connections to London is expected to become the gateway and focal point for Cambridge’s expanding technology cluster. “The unique design of the building reflects its aims and objectives – to create and curate a collaborative, entrepreneurial community of start-ups and scale-ups working on disruptive technologies that have the potential to change the way we lead our lives” . The Centre was part-funded by the Department for Business, Energy and Industrial Strategy (BEIS) and is operated on a membership basis by workspace operators Central Working on behalf of Trinity College. The Centre is the largest of Central Working’s global network of membership-based communities. Members have access to spacious communal facilities throughout the building ranging from the Centre’s boardroom, meeting rooms and open-plan kitchens to Skype booths, breakout areas with comfortable sofas and a yoga room. Non-members, including local residents, are welcome to use the café, and anyone in the wider community can host their technology events in the 130-seater auditorium free of charge. The aim is to attract smart, ambitious, like-minded entrepreneurs and companies both from Cambridge and beyond, co-locate them in scalable, state of-the-art facilities, immerse them in a collaborative, entrepreneurial culture, and connect them to investors, partners, mentors, advisers and potential customers. Accelerator programmes are run on a wide range of business and technical topics. These programmes are a core component of the Bradfield Centre’s offer which is designed to help grow businesses to a large scale at pace. The Bradfield Centre’s lakeside setting and external pavilion. The new Centre replaces an older two-storey building constructed early in the Park’s build-out. Its design maximises and intensifies the plot density creating a three storey massing of 5,257m² GEA (incl. plant). The instantly recognisable ‘arc’ shaped plan of the building is derived from its sinuous lakeside setting, and the interior design concept creates a unique internal environment which is open 24/7. A key design ethos was to facilitate serendipitous interaction and encourage occupiers to freely move across the floor plate. “Following the curve of the lake, the building nestles into the environment and feels very much an integral part of its natural surroundings. That makes the Bradfield Centre a very special place”. 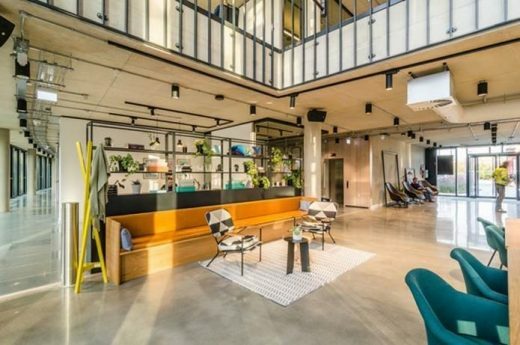 London based co-working space provider Central Working’s key objective was to create a gateway shopfront for start-ups and SME’s, introducing a contemporary collaborative working environment to the Park and region. The specific requirements of co-working space users, with their desire to emulate a ‘coffee shop’ environment, challenged conventional BCO workplace standards through use as well as the selection of finishes and furniture. Central Working’s model specifically requires glazed office ‘pods’ which provide a degree of visual and acoustic privacy, but this is counterbalanced with generous breakout facilities. The split between personal and communal space is moderated by Central Working’s membership model. Building reception and atrium with a view to the lakeside promenade. A central core and two escape stairs, as well as all cellular offices and meeting rooms, are positioned away from the lake frontage. This, in turn, allows for clear linear floor space oriented to the western lake frontage. 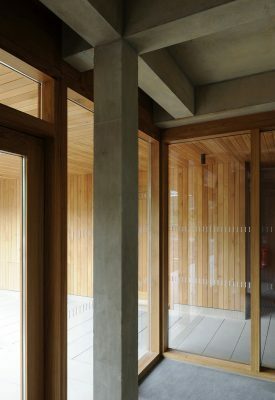 A full height atrium is positioned at the south west part of the floor plate and opens towards the lake side. Smaller social gathering spaces, open work desks and meeting spaces are arranged around it. The atrium also accommodates the ground floor café / restaurant space which overlooks and opens out to the lakeside. A small, freestanding lake pavilion provides for outdoor working and meetings. Internal materials and finishes comprise carefully juxtaposed natural concrete surfaces with exposed metal raised floors and hand-picked FF&E design. Bespoke furniture, lighting, soft furnishings and natural timber surfaces all combine to create a series of relaxed, boutique style internal spaces and experiences. Members occupying office ‘pods’ are encouraged to create their own signage / branding identity, which is key to engendering a sense of ‘ownership’ within the space. The artwork selection for the project includes the geometric, kinetic light feature in the entrance atrium which can be manipulated using a mobile app. Research has shown that high levels of fresh air and good environmental comfort are fundamental to the health and wellbeing, productivity and performance of building occupants. As such, the design team ensured that displacement ventilation and occupant controlled natural ventilation were protected within the construction budget. A flexible approach to building ventilation, which accommodates tenant fit-out without the need for costly and difficult alterations to ductwork, plant and controls, is key to the success of this project. View of the triple height reception and ‘kinetic’ light sculpture. In the four months since the Bradfield Centre’s opening, the building’s café has quickly become the heart of the Science Park. It is designed to be the kind of place where people are comfortable to drift in for breakfast, lunch or for a drink after work, either on their own or with a colleague. 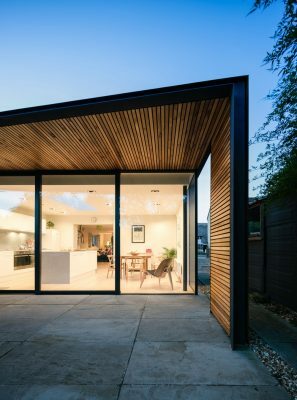 One member commented that, despite its industrial look and feel, the building exudes a warmth not usually associated with buildings of this scale or style. 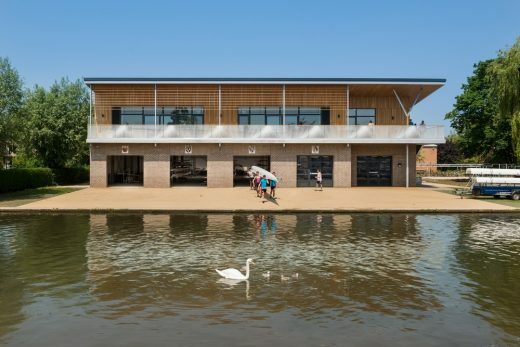 The Bradfield Centre has successfully challenged conventional aspects of workplace design, creating a shopfront not just for entrepreneurs but also for the local Science Park community, and has emerged as a local landmark within the Park. 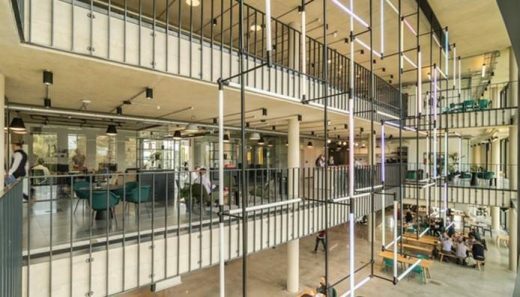 The building is at the vanguard of sustained and growing interest in co-working within the Cambridge region, and has set new standards for other space providers to meet.